"Revolve, which recently filed for an IPO and generated sales of $400 million last year, has never been a brand to highlight diversity, but whether or not that has had an effect on its sales is unclear. Revolve’s earned media value (EMV) dropped during the controversy to the brand’s lowest for the year, at $83.8 million, according to the marketing technology firm Tribe Dynamics. A spokeswoman for Tribe said that cannot be solely attributed to the controversy, however, but “to the natural ebb and flow of events and campaigns.” And the dip was temporary: Revolve’s EMV bounced back to more than $140 million in each of the subsequent two quarters." "So far, this autumn’s drops have at least generated notable consumer buzz. During September 2018, #ThomasBurberryMonogram drove more than $100,000 in earned media value for the brand, and #TheBSeries drove over $130,000, according analytics firm Tribe Dynamics. Overall, Burberry’s earned media value was $9.6 million for the month, up from $5.4 million from August. Tribe attributed the jump to the chatter around the new drops, as well as an increase in content around the runway show." So Exactly How Did Fashion Nova Turn Around Those Kardashian Looks So Fast? "Fashion Nova boasts more than 13 million followers on its Instagram feed and an army of 3,000 influencers, known as #NovaBabes, promoting its clothes. That group drove $54.1 million in earned media value, or the value of the publicity it receives via posts and engagement on social channels, from the second half of last year through the first half of this year, according to Tribe Dynamics, a San Francisco-based marketing technology firm. “They run one of the most sophisticated influencer programs that we track,” says Conor Begley, Tribe’s co-founder." 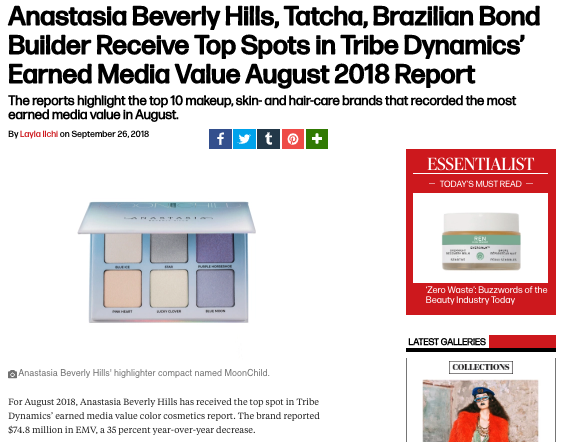 "Anastasia Beverly Hills topped the Tribe Dynamics earned media value color cosmetics report for February. The brand recorded $105.1 million in earned media value, flat from the previous year. Its earned media value can also be attributed to the pre-launch of the brand’s collaboration with influencer Amra Olević. The highlighter in the collaboration collected $14.9 million in earned media value with content from 929 influencers." "In the last few months, the legacy beauty brand Mario Badescu has brought itself back into the spotlight by pushing new products on social media and through influencer marketing. As a result, it made Tribe Dynamics’ top 10 roundup of skin-care brands with the most earned media value for the month of February — its first time on the list." "According to Tribe Dynamics, 90 percent of brands have increased their earned media budget (which includes influencer marketing) in the past five years."